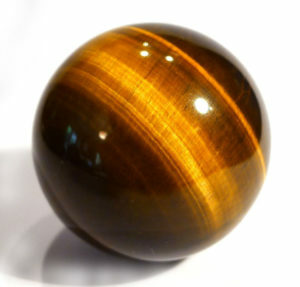 Gold tiger’s eye is the ‘Marmite’ of the crystal world, and divides opinion – many people love it, while others dislike it, or find it challenging and difficult to wear or work with. I’ve rarely seen so much superstition attached to a stone with so little tradition surrounding it. 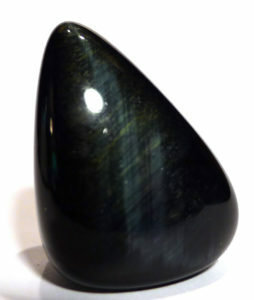 The vast majority believe it is a good luck stone, that will bestow abundance, and it is sometimes carried in a purse or wallet for this purpose. The few who find it challenging associate it instead with bad luck, and won’t have it near them. If you decide this is a crystal for you, in addition to the ‘good luck’ aspect, gold tiger’s eye is grounding and protective, without the heaviness of some of the Root Chakra crystals. It is also warming and stimulating, and strongly associated with creativity and the creative process. It is helpful in clearing ‘stuck’ energy in the Solar Plexus, when placed directly on the chakra in a layout, and brings with it a sunnier, more positive outlook. 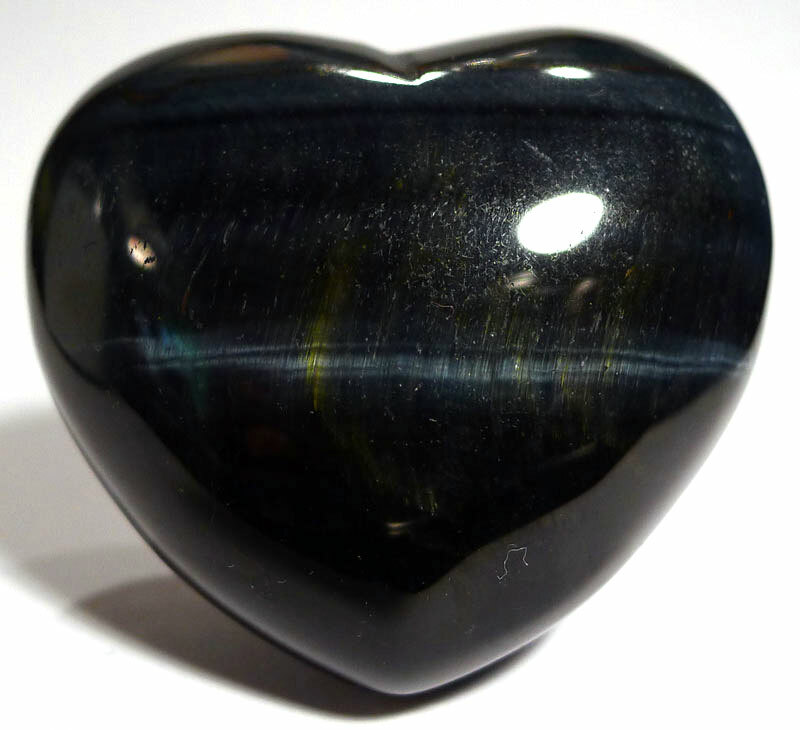 In spite of its colour, blue tiger’s eye is usually considered to be aligned with the Root Chakra, as it is very dark, and incredibly grounding and protective. It is also very calming, giving a soft, cocooning sense of safety and nurturing. This makes it helpful in achieving a deep meditative state. When aligned with the Throat Chakra and communication, the quartz comes into its own, helping the user to communicate with clarity, cutting to the chase, and also encouraging communication on a higher level. In common with other deep blue minerals, it appears to support and reconfigure brain function, assisting synapses to find new pathways, particularly when there has been damage. 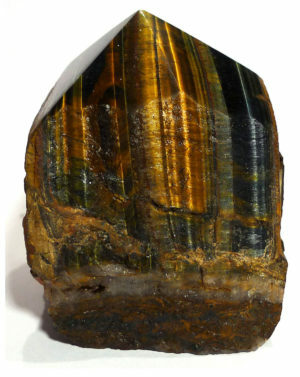 Tiger’s eye is a quartz, which is chatoyant because of the parallel intergrowth of quartz crystals and altered amphibole fibres that have mostly turned into limonite. For more than 100 years it has been believed to form when parallel veins of crocidolite (blue asbestos) are metamorphically altered to iron oxides (giving it its gold colour), which are then replaced by quartz. In the case of blue tiger’s eye (also known as ‘hawk’s eye’ or ‘falcon’s eye’), the crocidolite is not altered before the quartz replacement, and retains its original blue colour. In 2003, Heaney and Fisher argued that tiger’s eye is not a replacement mineral but “classically exemplifies synchronous mineral growth through a crack-seal vein-filling process.” However, you’ll find that most mineralogy books stick to the original explanation. Both varieties are very popular in jewellery making and gemstone carving. Some sources suggest that blue tiger’s eye (hawk’s eye or falcon’s eye) has been worn as a talisman against witchcraft, demons and the ‘evil eye’ since the Middle Ages. However, this seems unlikely, as I have been unable to find reference to it in Mediaeval lapidaries, and given its locality (tiger’s eye is found primarily in South Africa, Namibia, India, Myanmar and Australia, with exceptions being the Lizard Peninsula, Cornwall, UK, and California and Montana in the US), it probably wasn’t known in Europe prior to the 18th or 19th century.